Kris Kobach, the Kansas Secretary of State who leads the White House vote fraud commission, said Friday that DACA allows "a lot of gang-bangers" to be released after they get arrested. In an interview on MSNBC, Kobach said some DACA recipients, known as “Dreamers,” are not "especially high-achieving group" and he warned that permitting them to remain in the U.S. would “only encourage additional illegal immigration." "The DACA (population) is a cross section of the illegal alien population," Kobach said. "There are criminals, there are scholars. But it’s not an especially higher achieving cross-section of the illegal alien population." "What happens is a lot of gang-bangers get arrested, but the state won’t have the resources to prosecute all of them, and so they’re released," Kobach said. "It used to be before DACA that the local county sheriff would release them to ICE in hope that ICE would deport them," he added. "But we have many cases of such individuals who are getting the DACA amnesty —they’ve been arrested, they haven’t yet been convicted. But that arrest isn’t enough to disqualify them from DACA." 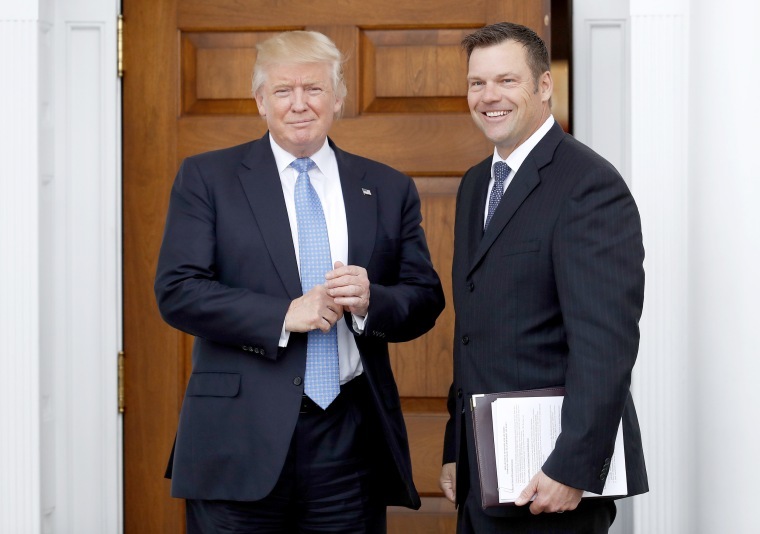 Kobach, who serves as vice chair of President Donald Trump's Advisory Commission on Election Integrity and has repeatedly suggested there is widespread illegal voting, was repeatedly asked to clarify how being arrested — but not convicted — made someone a criminal, but he responded only that removing a person from the U.S. "was not a criminal penalty." "Law enforcement can make judgments and say, 'You know what, we have to choose, we have limited resources, which person do we remove first? Let's remove the person who was arrested for a gang-banging activity or who was a gang member.'" Kobach’s comments came just days ahead of an expected announcement on Tuesday from Trump over whether he will end the Deferred Action for Childhood Arrivals program, the Obama-era policy allows the Dreamers who came here illegally as children to remain in the United States. Some also came legally but have overstayed their visas. The announcement will likely affect 787,000 "Dreamers" who signed up for the program.